There are a number of different drugs that have received classifications as a agonist or antagonist. These drugs actually work in counteractive directions. An antagonist works against a particular action while an agonist works toward producing a specific type of action. These two drug types are the main drug classifications in pharmacology. Most drugs operate in a variety of ways within the human body. When a drug has addictive properties, it will typically be considered an agonist or an antagonist. These are classified separately based on how they interact with neurotransmitters in the mind. An agonist can be either a direct-binding agonist or and indirect-acting agonist. This is based on the ways they operate in the mind. The direct-binding agonist works by binding to the receptor of a neurotransmitter. This basically causes the individual to feel the effects of the drug immediately since they are released into the mind. A direct-binding agonist includes drugs like nicotine, dopamine and apomorphine. With an indirect-acting agonist, your neurotransmitters are stimulated to release extra chemicals. One of the most common types of indirect-acting agonist is the illicit drug, cocaine. 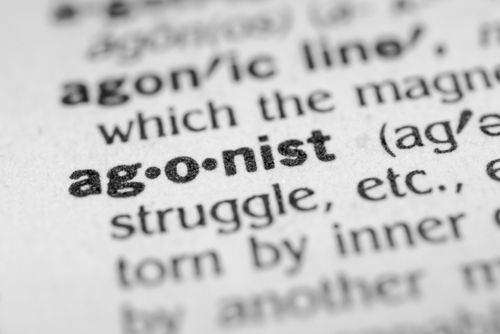 The word agonist is taken from the Latin word, “agnista”. In Latin, this word means to contender. This type of drug is designed to stimulate an action and can work to relax the muscles. Its entire goal is to help the production or increase of an action. Basically, this type of drug binds to the receptor site to provoke a response. It may cause a change in the chemicals or reactions that take place within the brain by imitating the way a neurotransmitter normally operates. The second main category of drugs is antagonists. These drugs are not made to bind to the neurotransmitters like agonists do. Instead, they operate by blocking the brain’s neurotransmitters from functioning correctly. In essence, there are two types of antagonist drugs: indirect-acting and direct-acting antagonists. With a direct-acting antagonist, the drug works by taking up the space in neurotransmitters and receptors that would normally be filled by other transmissions. Due to this, they effectively block the neurotransmitter from working. One common example of this drug type is Atropine. With drugs like Reserpine, the work is done via an indirect-acting antagonist. These types of drugs work by inhibiting the body’s ability to release neurotransmitters. Rather than blocking neurotransmitters from being received, they just stop them from being released instead. The word antagonist is derived from ancient Greek and Latin. The words mean a rival or competitor. It has this name because it competes against neurotransmitters by blocking them from working. This drug is the opposite of an agonist and basically stops the reception of neurotransmitters in the mind. It obstructs neurotransmitters, but do not change the way the mind operates in general. When the drug is working, it operates while muscles are contracting. An antagonist may do nothing while another drug from the agonist grouping does its work. Previous articleIs Corn a Vegetable? Next articleWhat Does Neurotic Mean?